A good thing has happened as my blog on my adventures in the Lone Star State continues to attract more readers — and that good thing is recommendations. 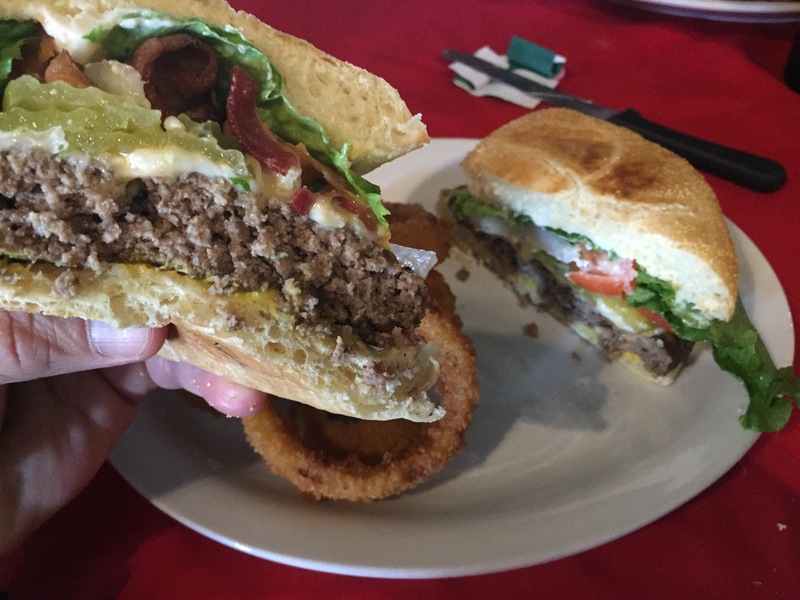 I love recommendations from those who email to tell me about things they enjoy doing in Texas and especially about places that serve a great burger. That’s how I learned about Marie’s Old Fashioned Hamburgers & More. 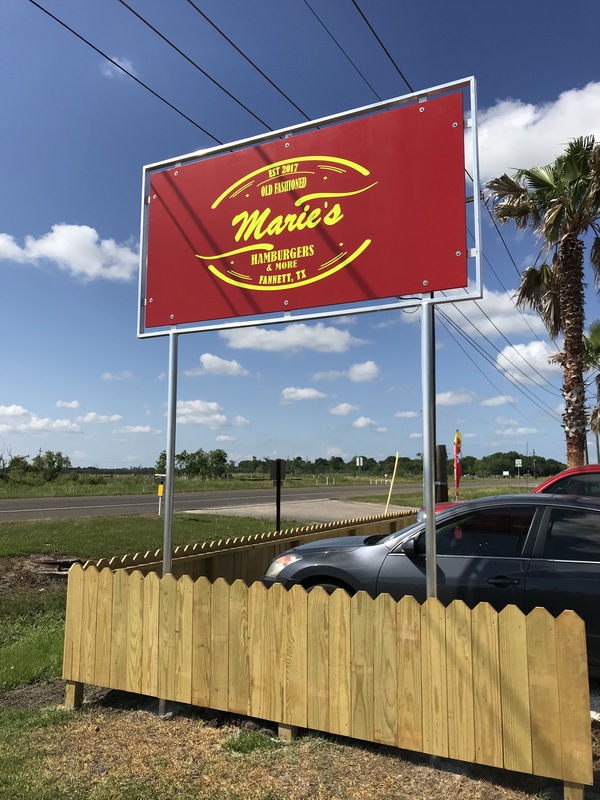 The Granger family, good friends who moved to the Beaumont area, alerted me to the grand opening of Marie’s in Fannett. Exciting news to someone like me who is always on the look out for a new burger joint. I couldn’t wait to head toward Beaumont to visit with my friends and to share a meal at Marie’s. A few days after Marie’s opened its doors, I was there and eager to place my order. 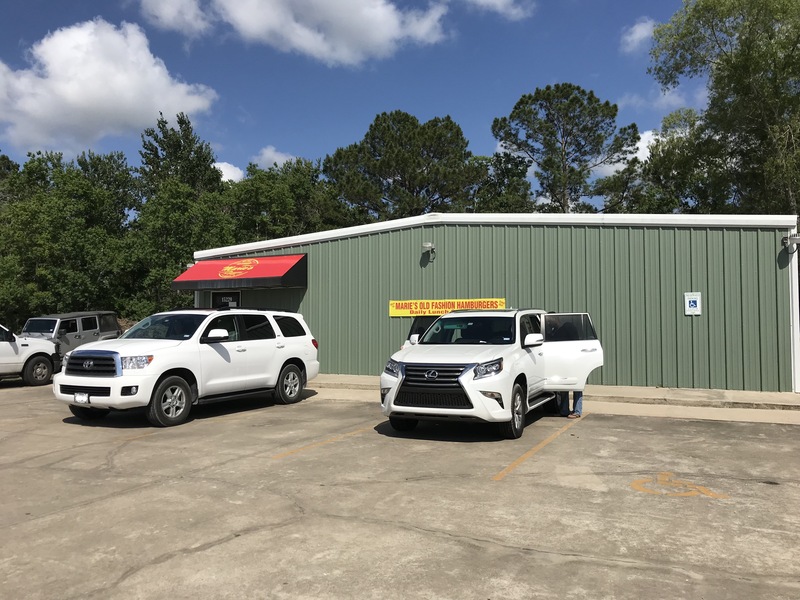 Located along Highway 124 near Beaumont, Marie’s occupies a simple building along this highway that parallels Intestate 10. As usual, I ordered a bacon cheeseburger with a side of onion rings and a tall glass of iced tea. Whenever I see a burger joint tag their burgers as old-fashioned I am immediately interested. I am not opposed to specialty burgers (I would eat one in a heartbeat). It’s just that I am quite happy with a good old tried and proven bacon cheeseburger. 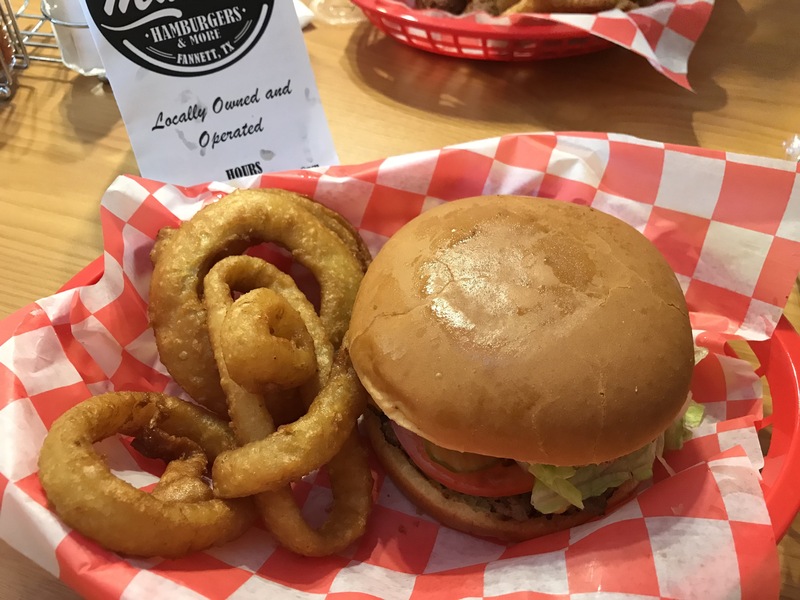 Marie’s promises hand-pressed patties on oversized buns with fresh vegetables and endless options to top off your burger. Burger buns are a super important component so I was happy to read that Marie’s offered oversized buns. For whatever reason, burger buns have a tendency to shrink once you start eating your burger. So, oversized is good. I am happy to report that Marie’s kept its promises on all fronts — oversized buns, fresh vegetables, crispy bacon, pepperjack cheese. Combined, each of these ingredients did its part to contribute to one really delicious burger. I was happy that my two-hour drive was not in vain. The burger was definitely worth the drive. 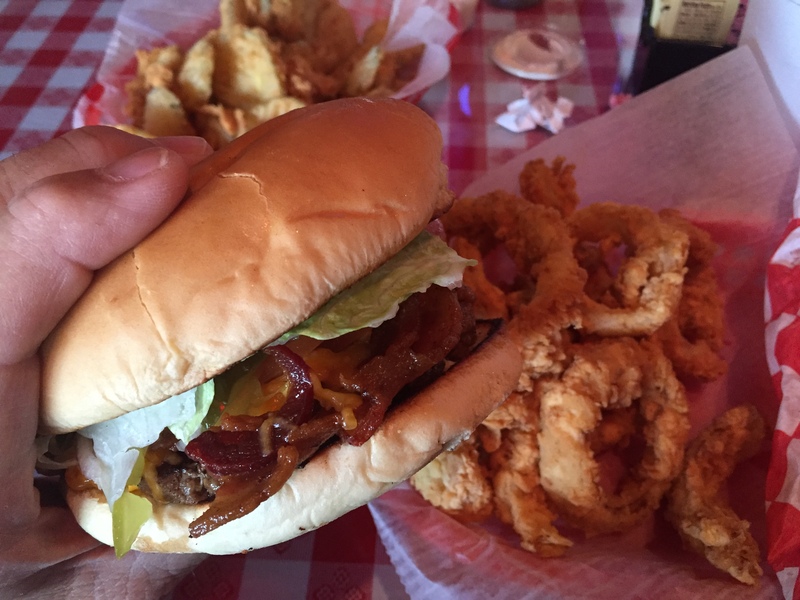 We are indeed blessed to have countless places in Texas that serve great burgers. I would need another lifetime just to visit them all. But, because I don’t have another lifetime, I am content to enjoy as many burgers as I can as I travel across Texas. Occasionally I stumble across a burger that is not noteworthy, but that is to be expected. 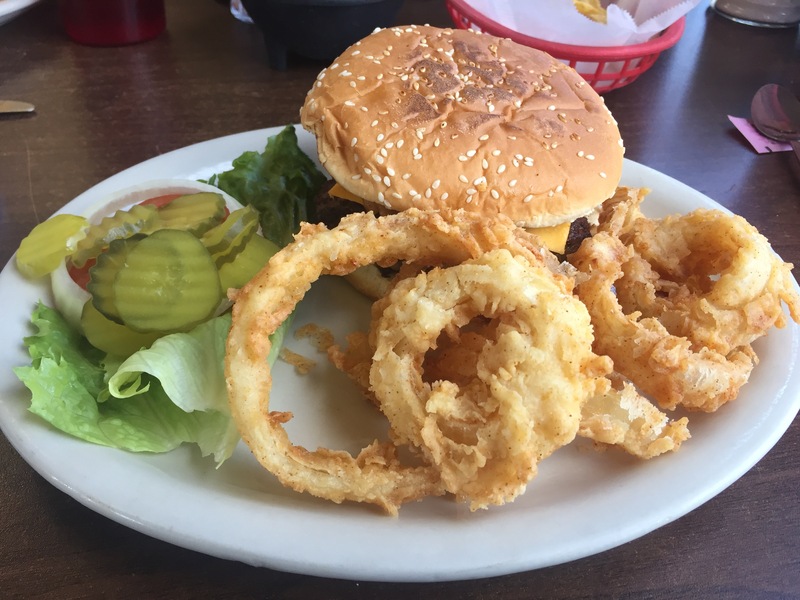 I prefer to be thankful for the many places, like Marie’s, that serve up a delicious burger. As I have often noted on my burger reviews, since you are going to eat anyway, be adventurous. Take a risk and discover new places to eat. And when you do come across a place that serves a great burger, please be sure to let me know. Needville owes its interesting name to August Schendel, the German immigrant who purchased a large tract of land and settled in the area in 1891. The following year, Schendel opened a general store to serve the people of the area popularly known as Schendelville. When Schendel made application for a Post Office, he tried to use the name Needmore because everybody seemed to need more things. Makes sense! The Post Office, however, denied the application because the name was already taken. 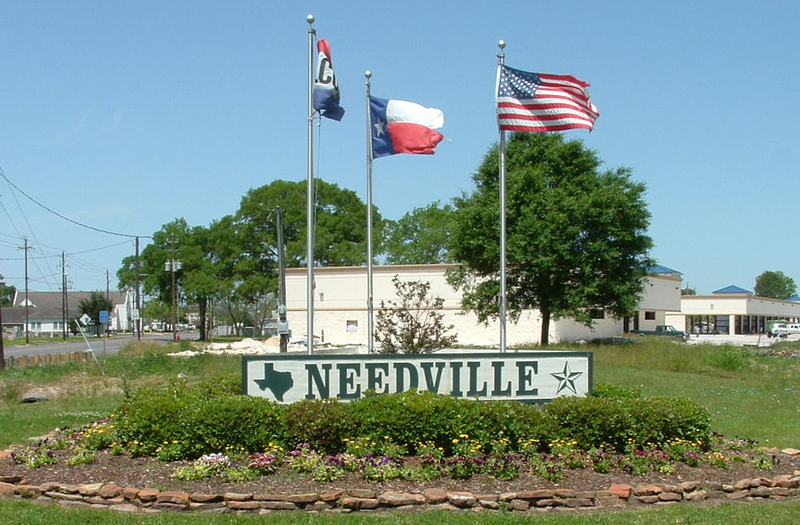 So, Schendel settled for the name Needville. The rest is history. Located on state highway 36 in Fort Bend County, ten miles south of US 59 and southwest of Houston, Needville still lives up to its name. 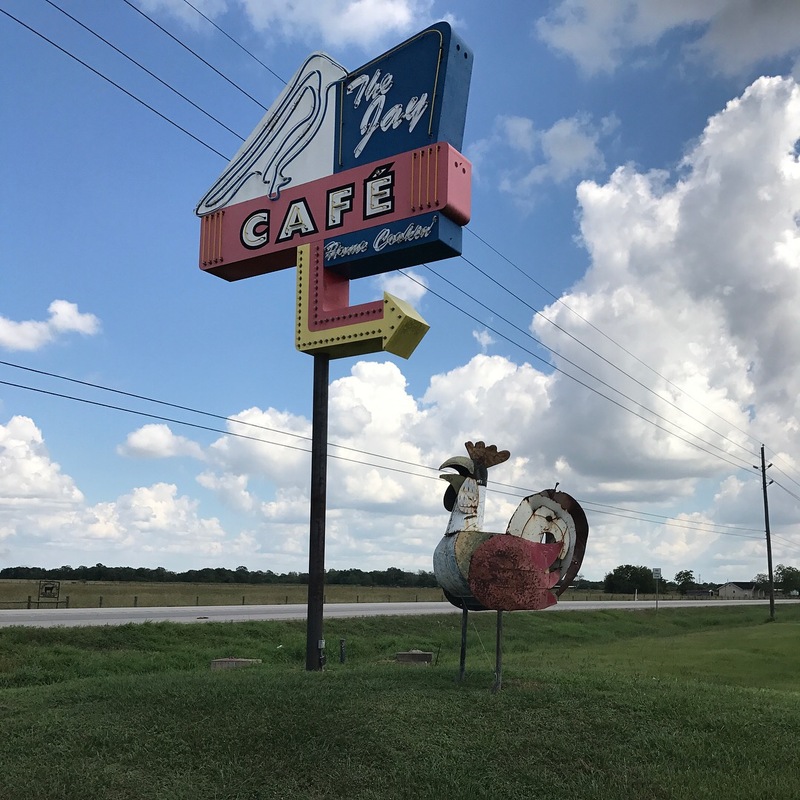 If you find yourself with a huge appetite and in need of great food, then you should get to The Jay Cafe in Needville as quickly as you can. This place serves up home cooked dishes at their best. While I was momentarily tempted by the menu-full of delicious meal options, I ordered the Bacon Jay Burger and opted for the house seasoned fries instead onion rings. And, of course, a tall glass of iced tea — the perfect choice after a morning of adventuring with my wife’s Texas Master Naturalist group. My burger arrived piping hot and flanked by a heaping serving of fries. I could see that I certainly would not need more bacon. This burger had a healthy helping of crispy bacon and cheddar cheese served on a moist bun with absolutely fresh fixings. Everything was visually right about this burger. Burgers, however, are about a whole lot more than optics. And this burger did not disappoint. One bite and I knew that this was some of the best meat I have tasted on any burger I have reviewed. The big, crumbly patty of meat was perfectly seasoned and cooked. Enjoyed every single bite. My only complaint is that I did not have room for dessert. The Jay Cafe offers a fantastic assortment of pies and a red velvet cake that looked absolutely amazing. Next time I visit I think I am going to start with dessert. At this point in my life I have no business buying green bananas or hoping I have room for dessert. Life its too short for that. 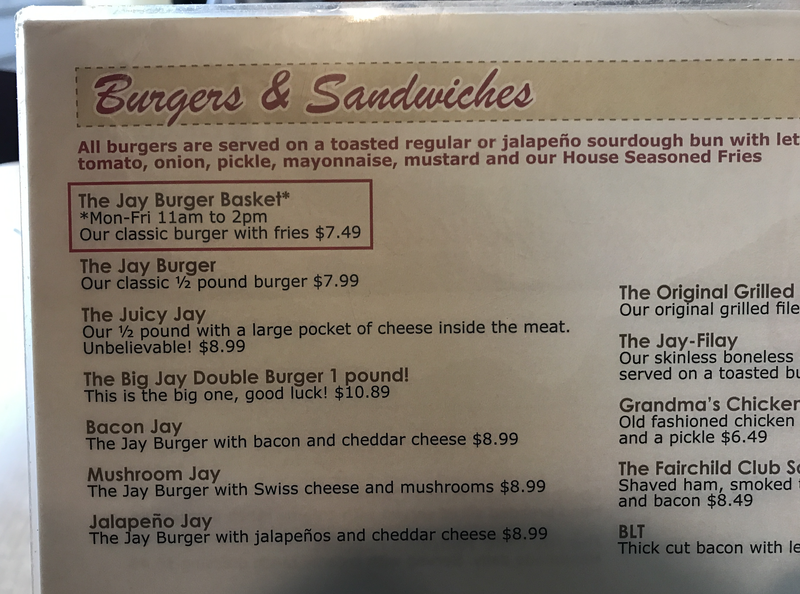 I am really glad that I visited the Jay Cafe in Needville. This place is just one more example of one of the many really good places to eat around the Lone Star State. Lucky for me that I live within driving distance. I certainly plan to eat at the Jay Cafe the next time I venture in their direction on one of my day trips. And, I will start my meal by eating dessert first! A fun part of my Texas road trip adventuring is discovering places that serve delicious burgers. 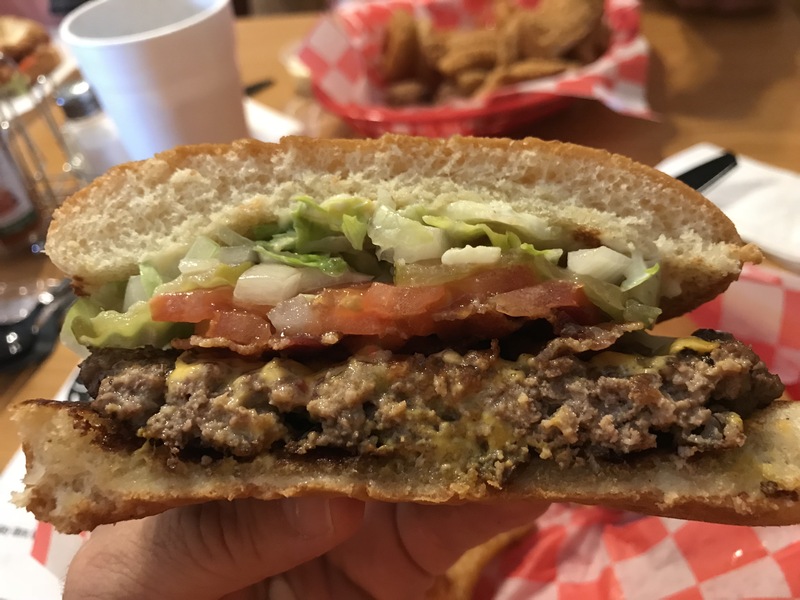 Over the years I have tasted some mighty fine burgers throughout the Lone Star State and others that were just ok but not blog-worthy. 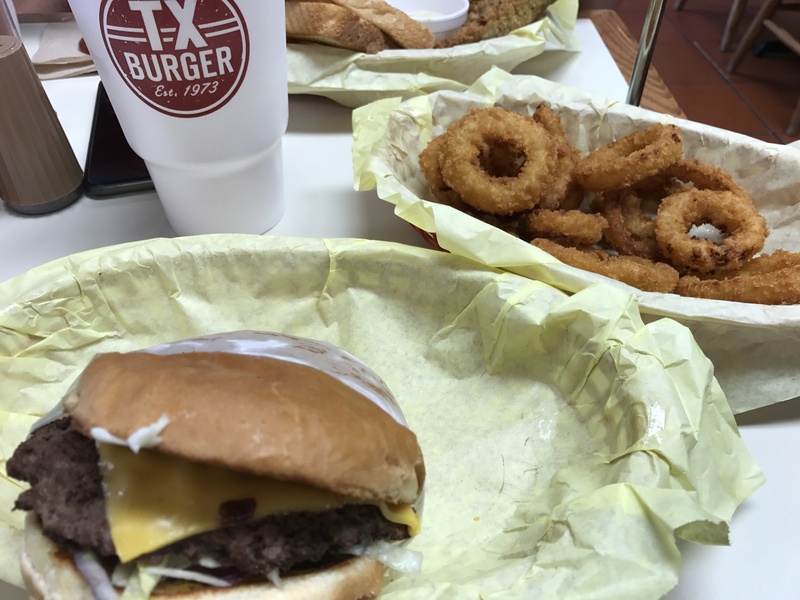 For quite some time I have wanted to stop by one of the TX Burger locations and finally had the opportunity to do so in Madisonville. 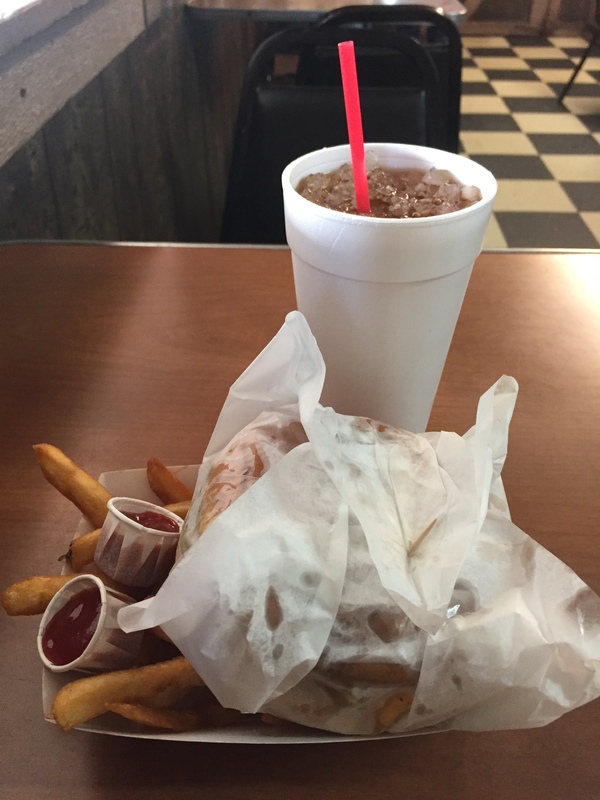 Madisonville is the official home of TX Burger. Back in the early 1970’s, a fellow named James Carter wanted to serve burgers as tasty as the ones his mom made at home. Using all natural beef and fresh ingredients combined with great customer service, Carter hit on the right combination. 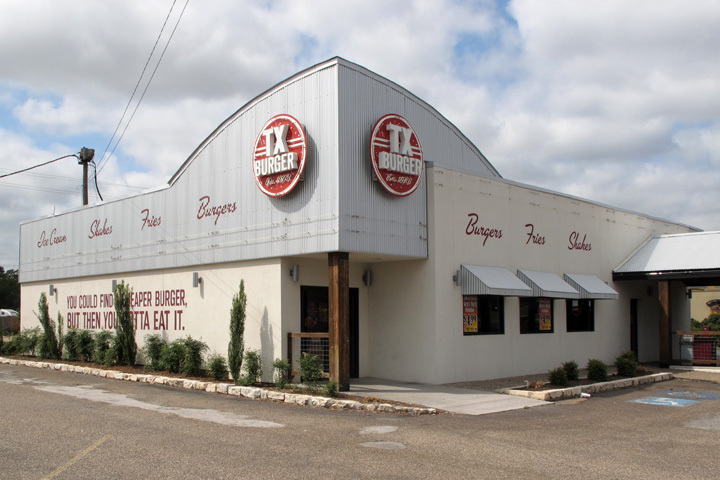 Soon, TX Burger became a huge success and has since added locations around Texas. I ordered my usual bacon cheeseburger with everything on it and a side of onion rings — all reasonably priced. In fact, I bought lunch for four of us and spent almost ten dollars less than I had spent on three of us the previous day on an “award winning” burger that turned out to be somewhat disappointing (that burger was definitely not blog-worthy). My bacon cheeseburger arrived hot and ready to eat. The first bite confirmed that I had indeed made the right choice. It was delicious. Everything about this burger was fresh and honest and the meat was moist and prepared to perfection. Nothing disappointing about this burger. Every bite was delicious. After eating my burger I turned my attention to the Blue Bell Ice Cream bar. This is Texas and Nolan Ryan beef and Blue Bell Ice Cream are certainly infused with Texas goodness. I bypassed the cone and opted for the biggest hand spun chocolate malt on the menu. Absolutely delicious and the perfect way to end this meal. 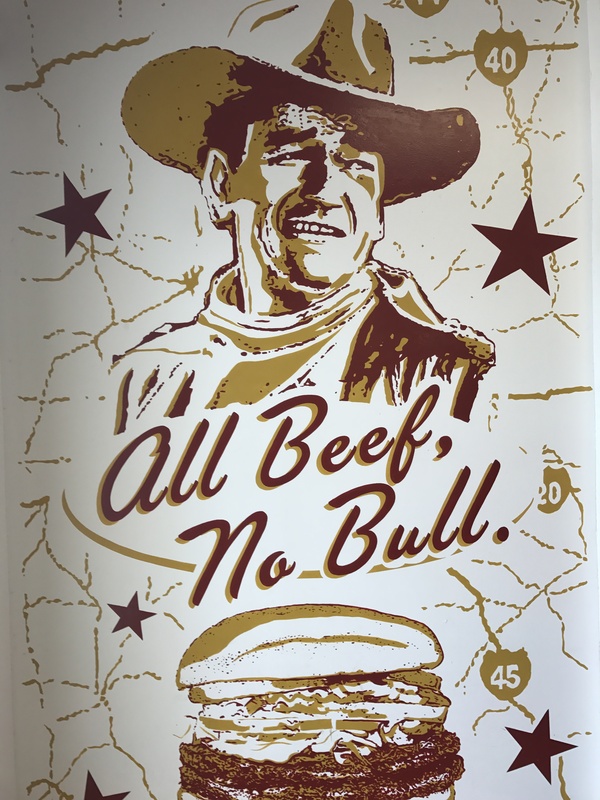 The next time you are on the road and see a billboard or sign for TX Burger, make it a point to head their way. You will enjoy the family-friendly atmosphere, their delicious burgers and sides — and, of course, the opportunity to eat some Blue Bell Ice Cream. I am certainly glad that I finally stopped to eat at TX Burger. I can assure you that this won’t be the last time! Comfort is just a tiny little dot on Texas roadmaps. Located west of San Antonio along Interstate 10, Comfort is a popular tourist area with great recreational access to the Guadalupe River. 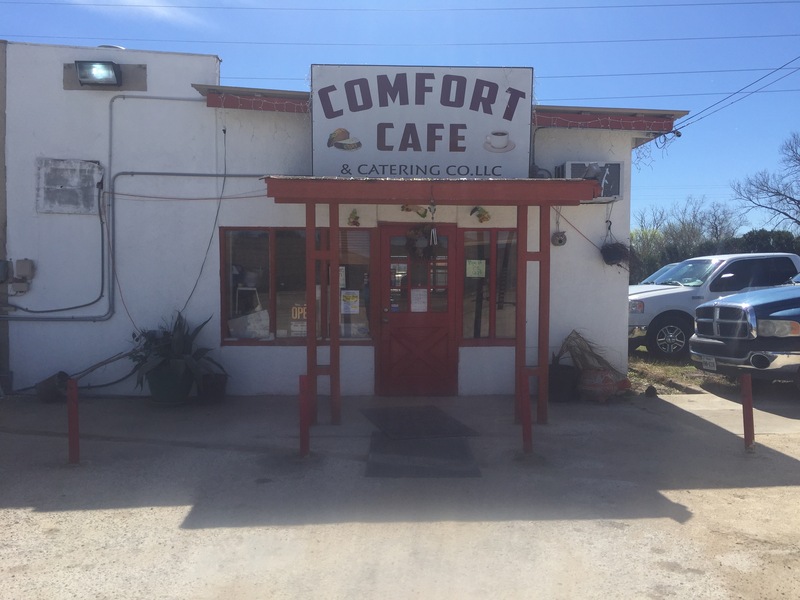 While traveling to Big Bend, my buddies and I approached Comfort just in time for lunch. Our hunger led us straight to the Comfort Cafe. 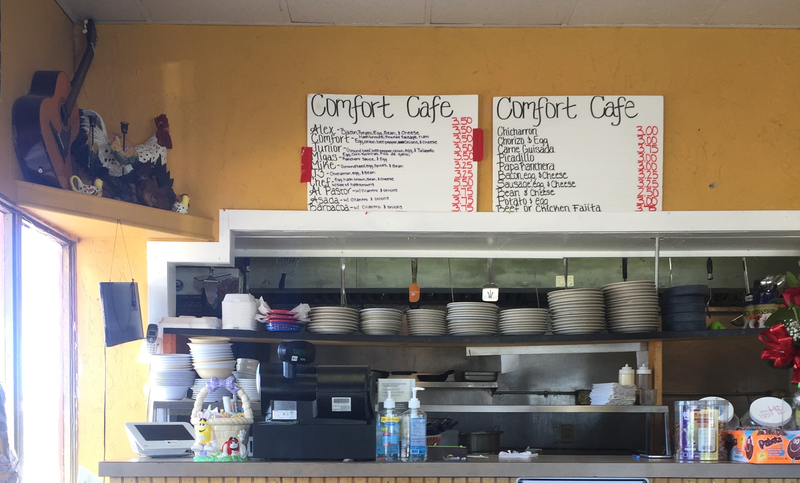 The Comfort Cafe is small enough to be considered a hole-in-the-wall but, as we would soon discover, big enough to deliver on flavor. The place was clean as a whistle and the staff was more than eager to help. Friendly staff always helps make any dining experience that much more pleasant. I ordered a bacon cheeseburger with a side of onion rings and a glass of iced tea — my standard order on my burger adventures. From where I was sitting I could see into the kitchen area where my burger was being made to order. I could even hear the meat sizzling on the grill, releasing its burger perfume into the air. When my order arrived I cut my burger in half and was pleased to see the generous portion of meat. The bacon was crispy, the cheese perfectly melted, and the bun lightly toasted. All of the ingredients were obviously fresh. The only thing that remained was to take a bite. Bottom line — the burger was unquestionably tasty. Everything about this burger worked well together. Someone had obviously given some thought to how a burger should be prepared and did not compromise at any point on delivering a delicious burger. I made it a point to thank the folks in the kitchen, something easy to do in a small place like this. The Comfort Cafe has only been opened a short while, but I am confident it will be around for a long time. If I lived anywhere near Comfort I would surely make it a point to make my way to the Comfort Cafe as often as possible. I loved the whole dining experience, especially the ambiance that is unique to small town mom and pop eateries. 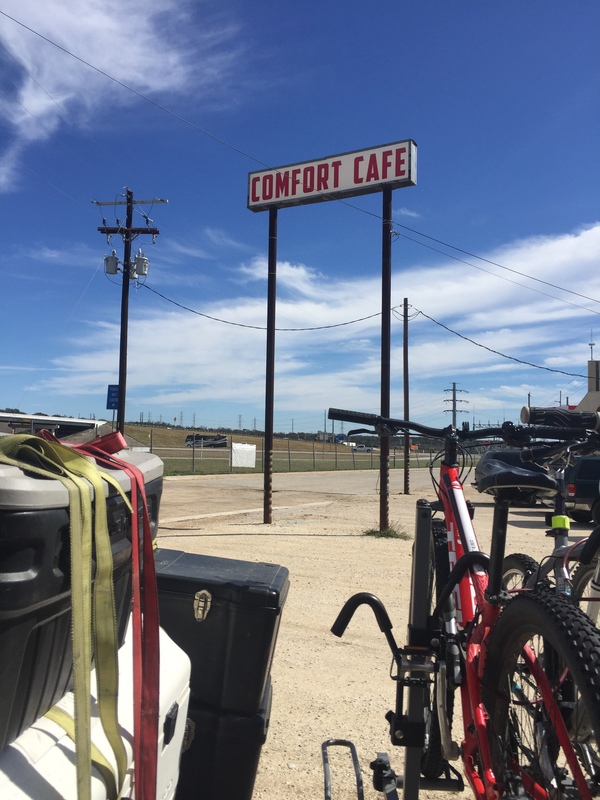 If your road trips ever take you anywhere near Comfort, consider pulling off the main drag and making your way to the Comfort Cafe. 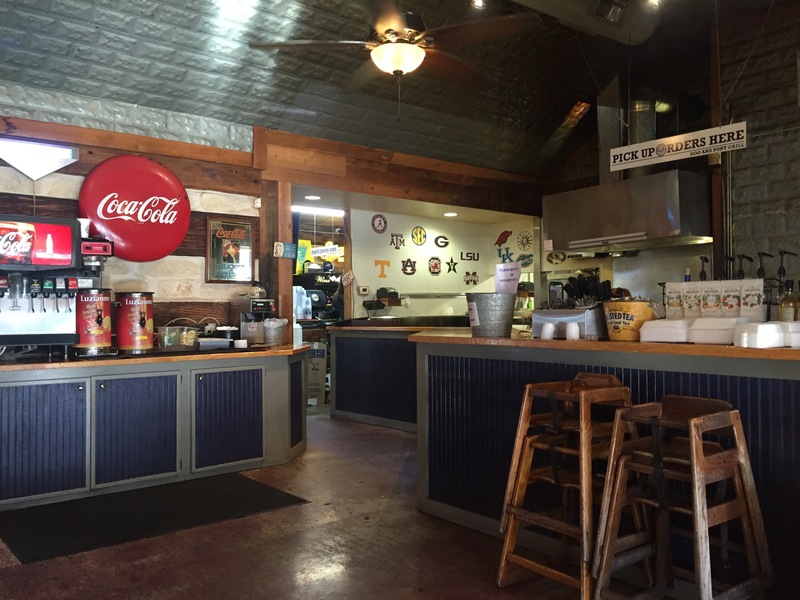 Little stops along the way like the Comfort Cafe just add a magical element to any road trip. Embrace the experience. Enjoy the food. Make good memories with friends and family. Terlingua is a place like none other in the Lone Star State. Nestled between Big Bend National Park and Big Bend Ranch State Park, this ghost town has a character uniquely its own. The name of the town is derived from the Spanish words “tres lenguas” meaning “three tongues” — a reference to English, Spanish, and Native American, the three languages spoken there in the days of the Old West. If you have never ventured to the Chihuahuan Desert or to Terlingua, you owe it to yourself to visit this fascinating and mesmerizingly beautiful part of Texas. Terlingua was once a thriving mining town that was abandoned after the Second World War. 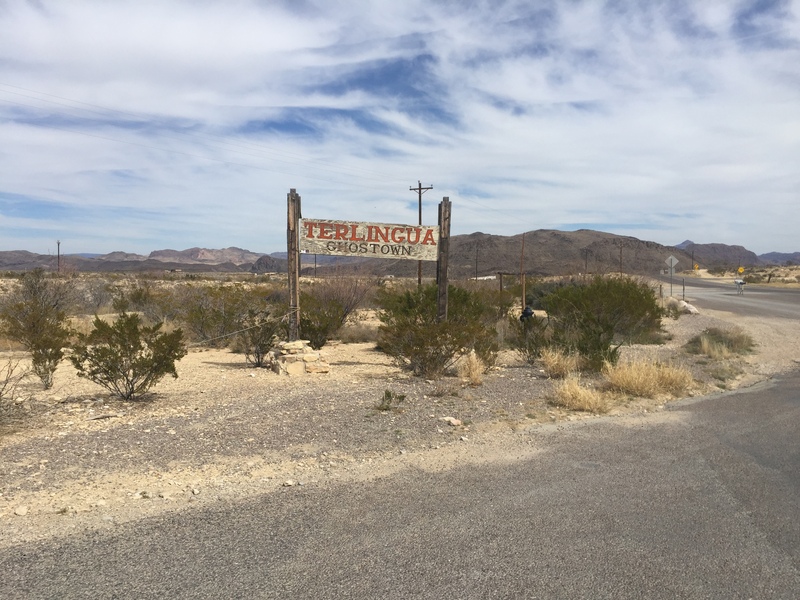 Starting in the 1970’s, Terlingua became a destination for adventurers, entrepreneurs, artists, musicians, and just plain folks who were bewitched by the old ghost town and decided to stay. 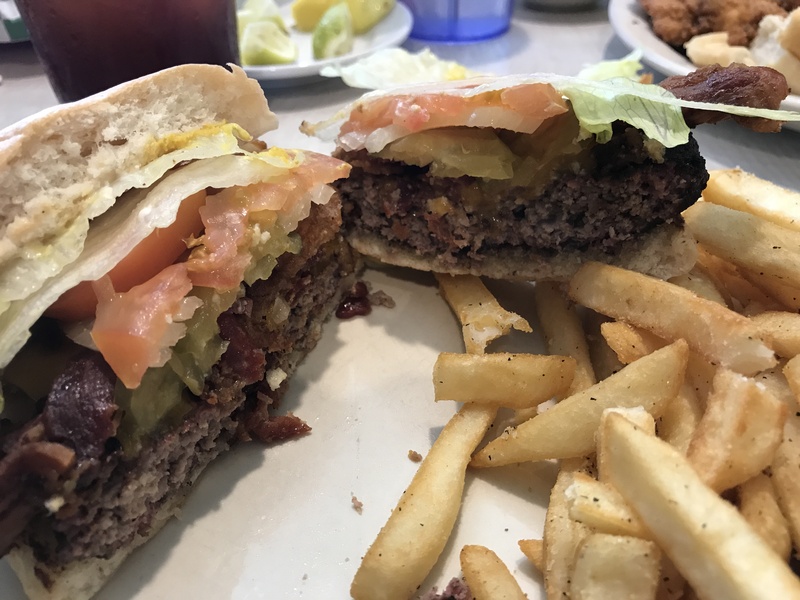 On a recent visit to Big Bend Ranch State Park, my buddies and I ventured to the High Sierra Bar and Grill in Terlingua in search of a hunger busting burger. 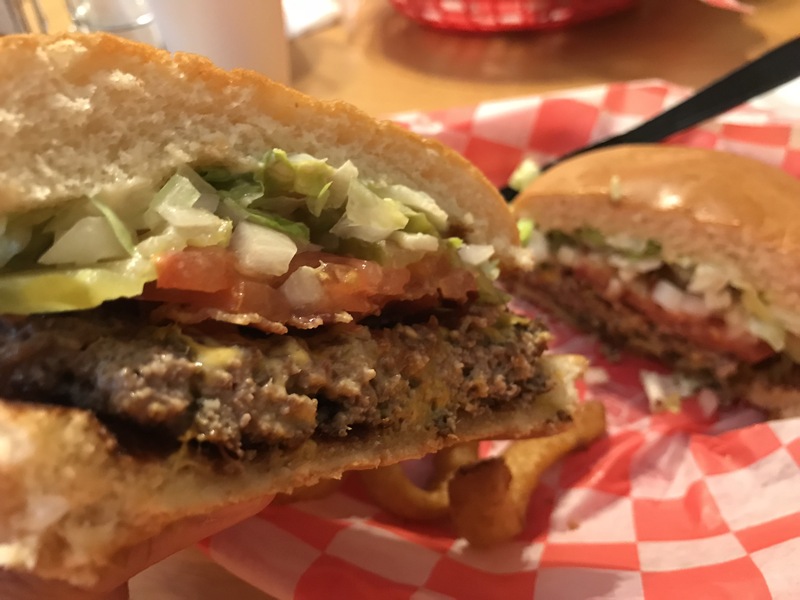 There are not a lot of places to eat in Terlingua so we were happy to find the High Sierra and even happier to learn that they had burgers on the menu. I ordered my usual bacon cheeseburger with a side of onion rings and a tall glass of iced tea. We enjoyed the ambiance of the place while we waited for our burgers. The staff was friendly. The iced tea was cold. The mix of locals and outsiders made for some interesting people watching. And the music was perfect, especially because Johnny Cash was on the playlist. My burger and hand-battered onion rings arrived hot and ready to eat. The generous-sized and cheese covered meat patty was cooked just the way I like. The bun was slathered with a combination of mustard and mayo, every ingredient was fresh, and the bacon was nice and crispy. I cut my burger in half and eagerly took my first bite. The first bite always tells the story. And this first bite was delicious. Wow — it was so good. I savored every tasty bite. When I finished, my only regret was that I did not have the bandwidth in my stomach (nor the metabolism) to do it all over again. Without question, this was one of the best burgers I have eaten in the Lone Star State. And the onion rings were pretty tasty in their own right. All in all — a delicious meal! 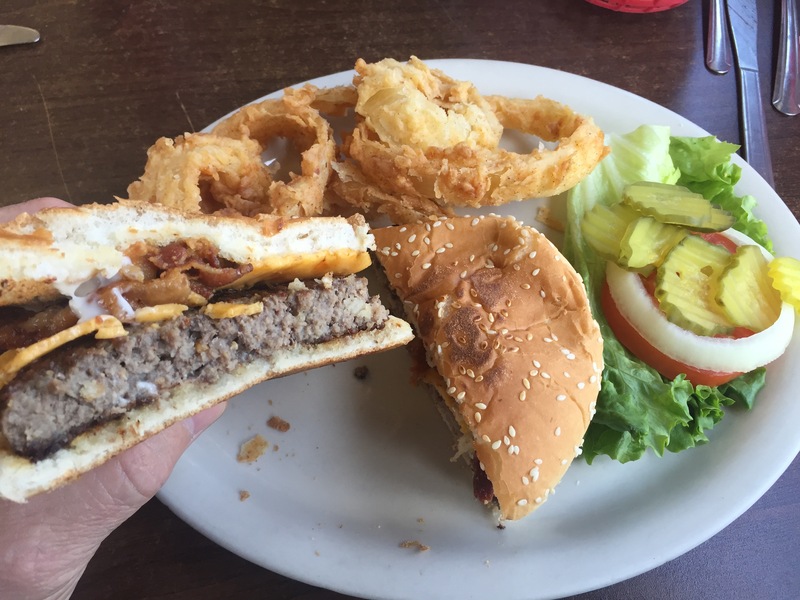 No matter where you go in Texas, you can find a delicious burger. However, you must be willing to get off the beaten path and walk into places you might not otherwise visit. I’m glad we stopped to eat at the High Sierra Bar and Grill. This eatery will remain high on my list of places to eat the next time I venture west of the Pecos River. 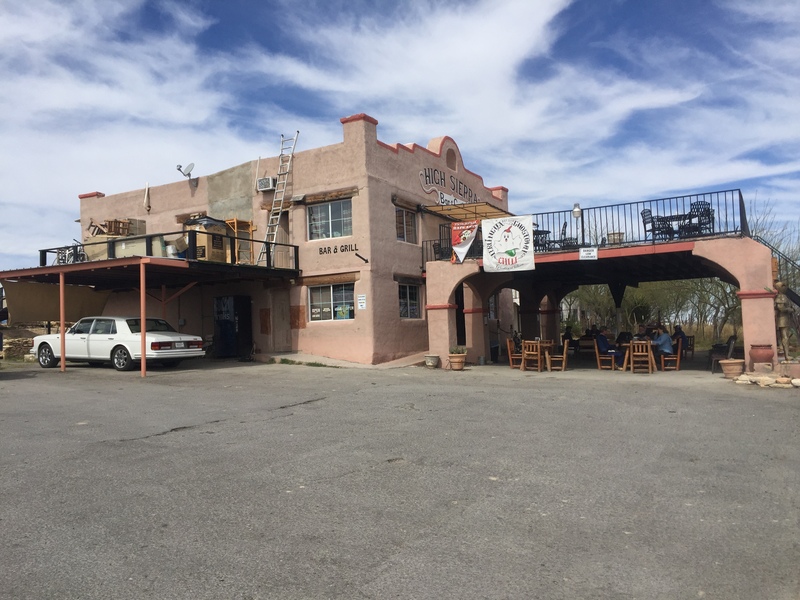 If you find yourself anywhere near the ghost town of Terlingua, check out the High Sierra Bar and Grill. One of the things I miss the most when I travel internationally is a good Texas hamburger. 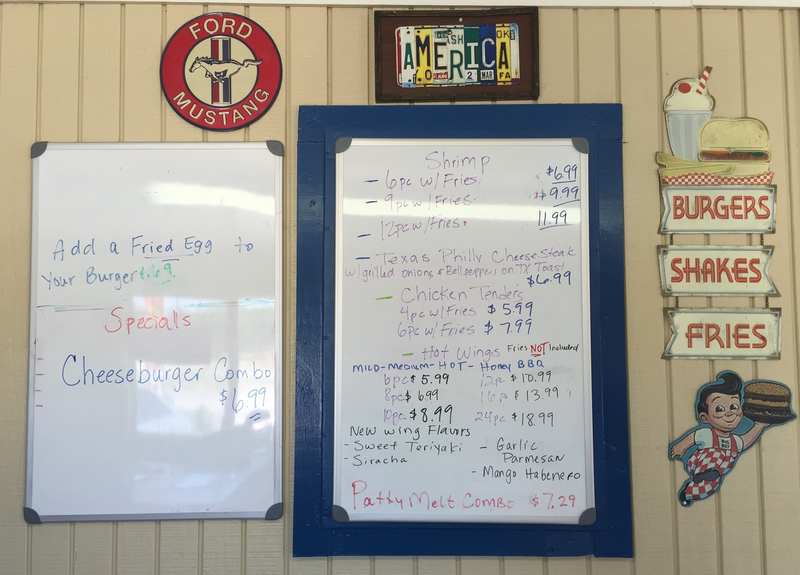 After returning home from back-to-back trips to the Amazon and El Salvador, I hopped in my pick up and headed to Rosenberg in search of a burger dive. As I often do, I stopped to ask a local for a recommendation. 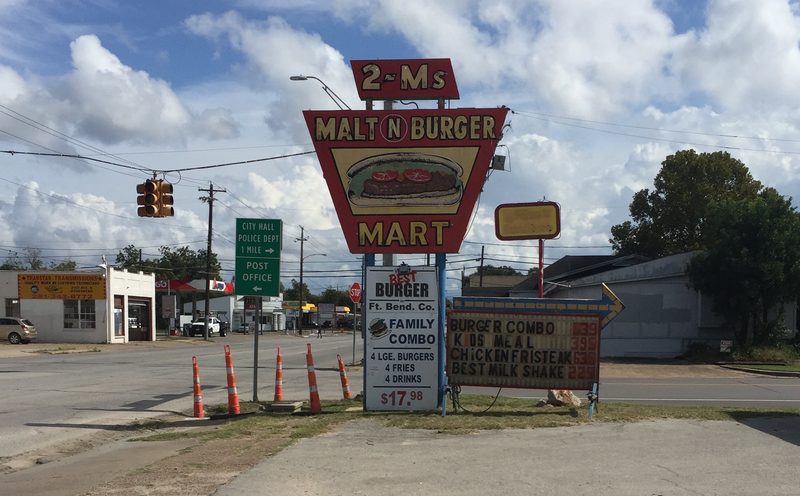 I had already eaten at the first two joints but had not heard of the third — 2-M’s Malt N Burger Mart. 2-M’s has been around since 1963. 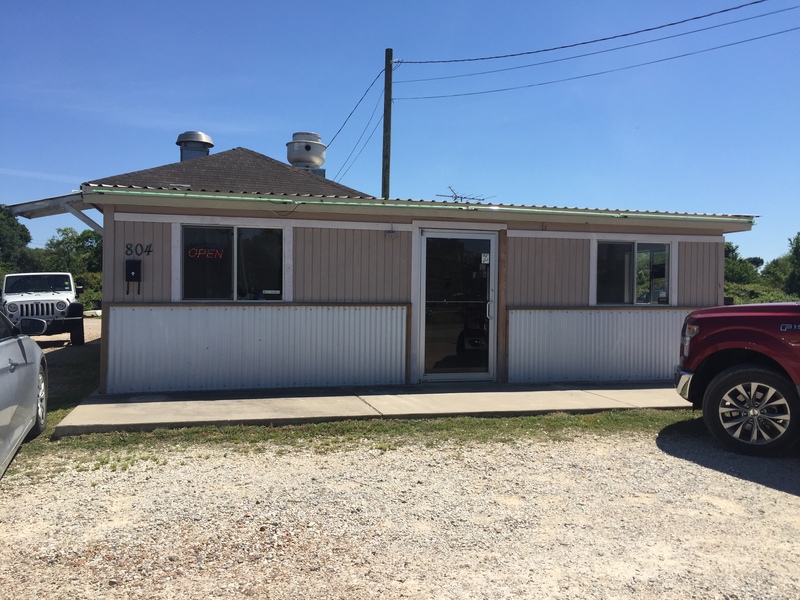 The drive-in style building features awning-shaded parking out front and a small dining area inside. I like places like this. Other than showing its age, this place looks pretty much the way it must have looked when it was first built. This was obviously a popular joint. Lots of folks ordered at the pick-up window while a few dined inside. I ordered a cheeseburger with all of the fixings plus french fries and sweet tea. I sat my burger deprived body down and waited anxiously to hear the words I longed to hear — Order 72. Within minutes I picked up my burger basket and tea and sat down to enjoy the first burger I have eaten in weeks. I unwrapped my burger and took my first bite. Not disappointed. This was just an honestly good burger built around a modest on-the-thinner-side meat patty. All of the flavors blended together well. I enjoyed the burger, not just because it has been a while since I’ve had a burger, but because it was genuinely tasty. 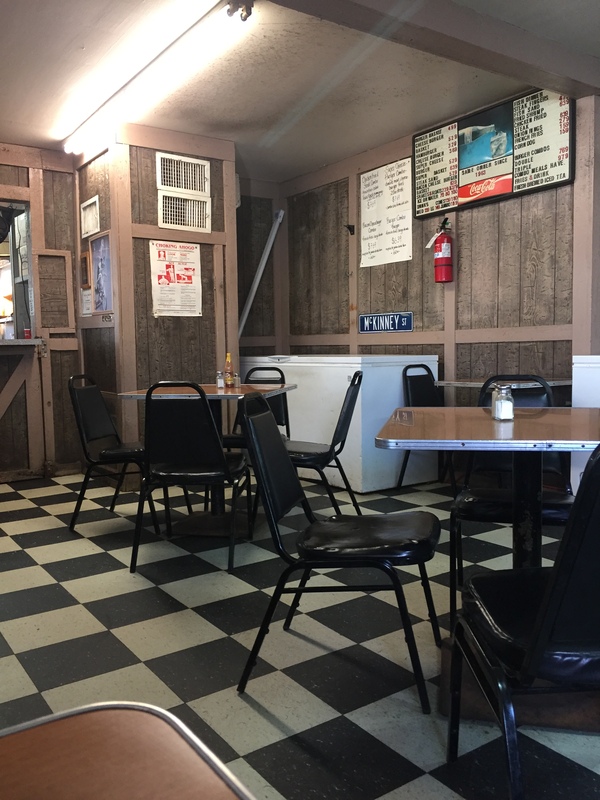 The sign out front boasts “Voted Best Burger in Fort Bend County.” Whether or not you agree with that assessment, you can’t argue against the fact that for the past 53 years the locals have cast their vote by keeping the doors of this joint open. That is the vote that matters the most. And, I’m glad that the place has retained its weathered vintage charm. Those of you who read my burger reviews know that I would rather eat at a burger dive any day of the week than to cross the threshold of a fast food joint. I love the adventure of stumbling across places like 2-M’s. 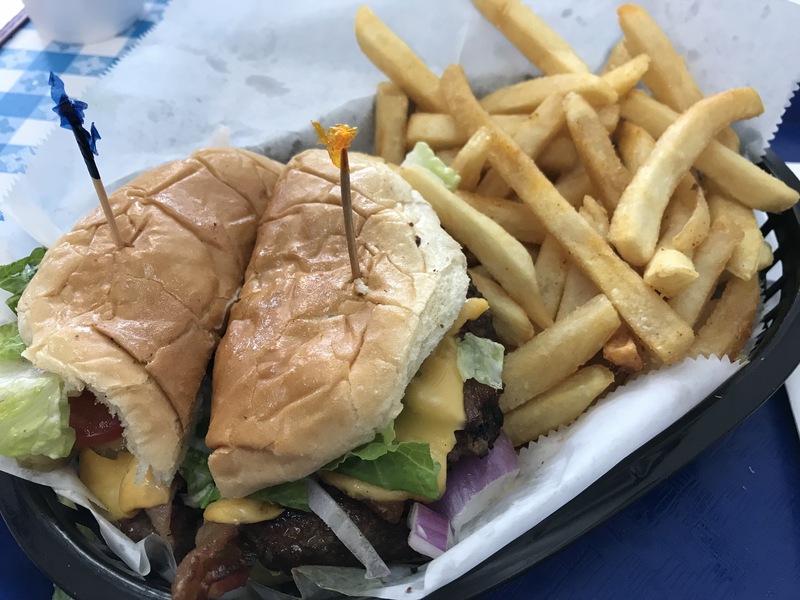 You might not live anywhere near Rosenberg, but I’ll bet that you can find a burger joint near you that will win you over with taste and charm. When you do, be sure to let me know and I’ll add it to my list of places to visit on a future Texas road trip. In my ongoing quest to enjoy the most delicious burgers in Texas, I not only look for the joints with favorable reviews but quite often with interesting names. 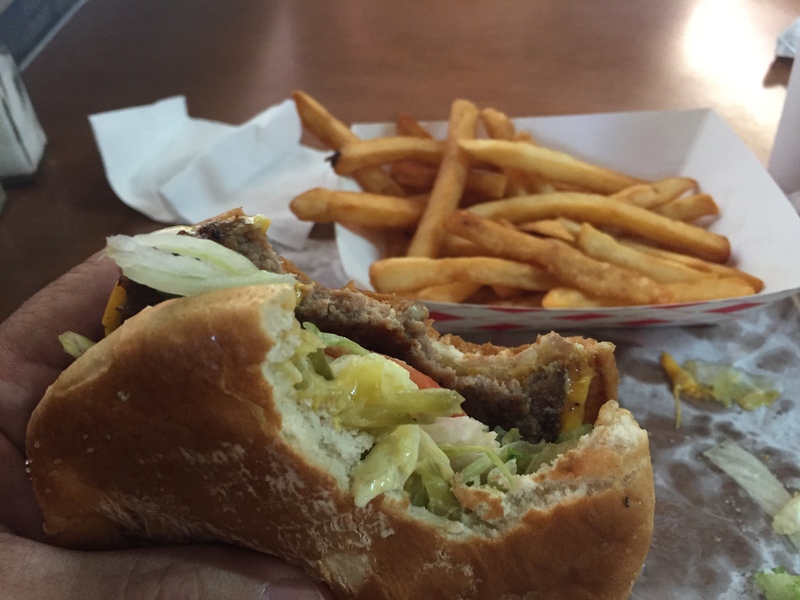 So, when I learned about The Burger Barn in Rosenberg I had to give it a try. I like the name. 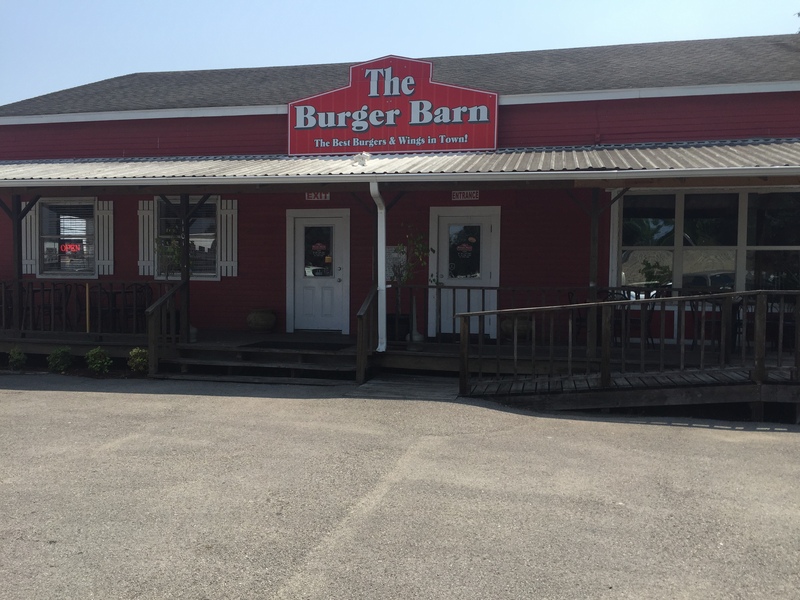 Burger Barn is just a simple and honest name that conjures up visions of good homestyle cooking. 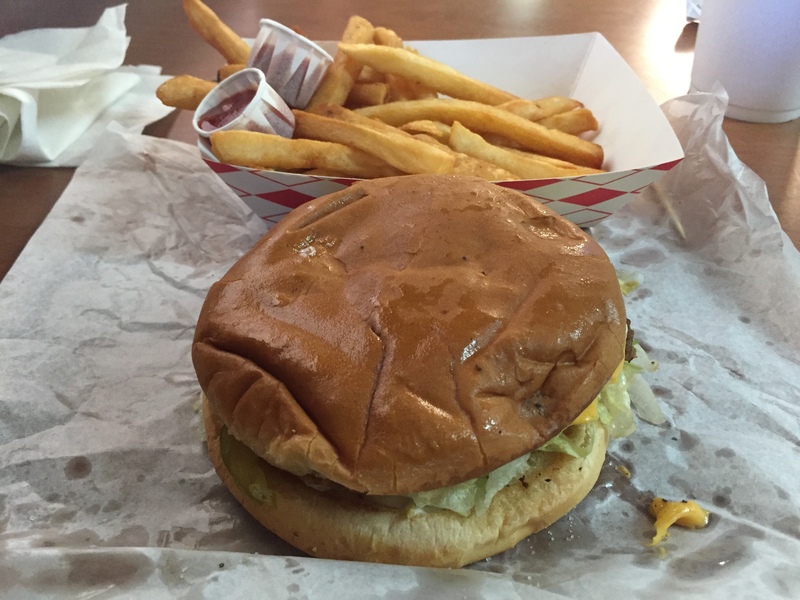 The Burger Barn has four locations in Texas, including Rosenberg. They promise diners more food, more taste, more service, and an always fresh experience. More is definitely good — especially when it comes to burgers. So, I called my friend Brad and his boys and asked them to join me on this culinary road trip to The Burger Barn. 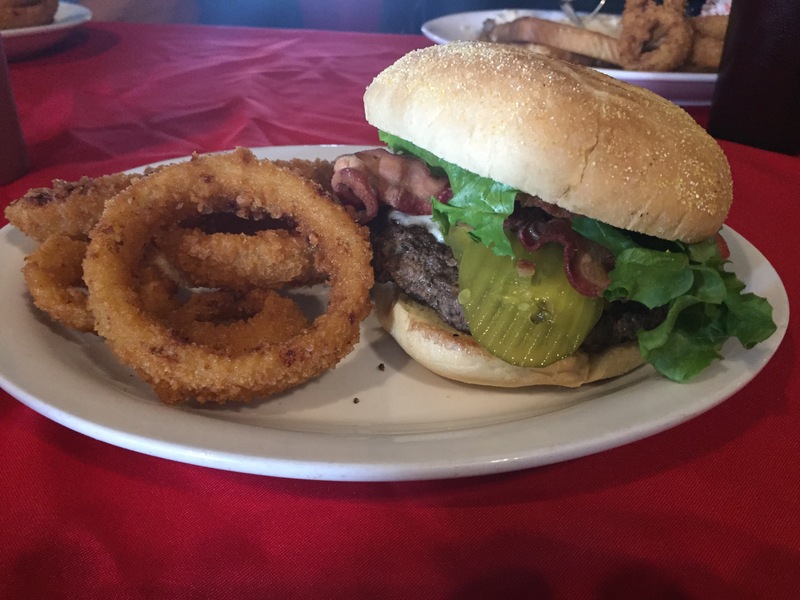 The Burger Barn offers an amazing selection of 25 burgers. As for me, I ordered burger number six, the Bacon Cheddar Barn Burger. This burger boasts a fresh patty made of 100% beef, smoked bacon, cheddar cheese, lettuce, tomatoes, pickles, red onions and mayo on a toasted bun. And, of course, I ordered a side of onion rings and a glass of iced tea. 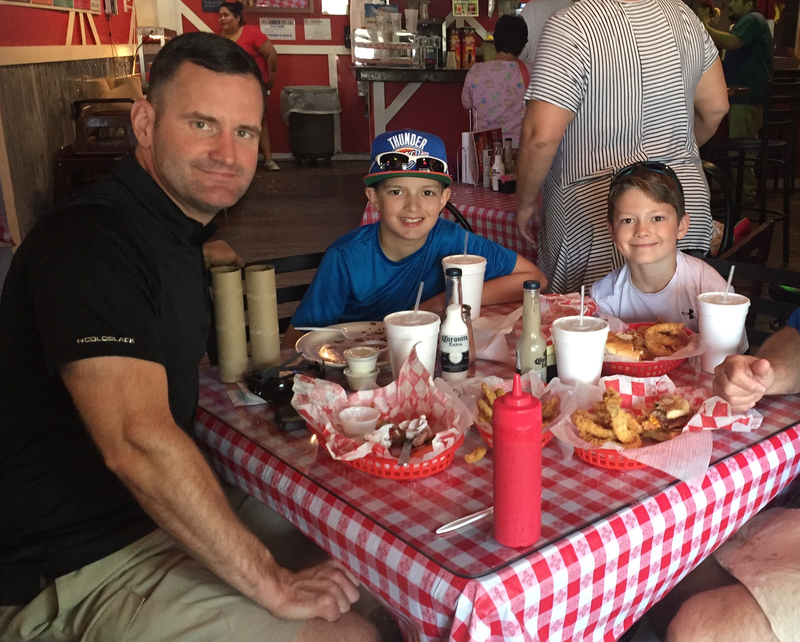 Brad and the boys ordered burgers, brisket, onion rings, and fried pickles. There was no danger of a food shortage at our table. The burgers arrived piping hot and wrapped in gingham paper. The aroma of the burgers was inviting and the onion rings looked amazing. 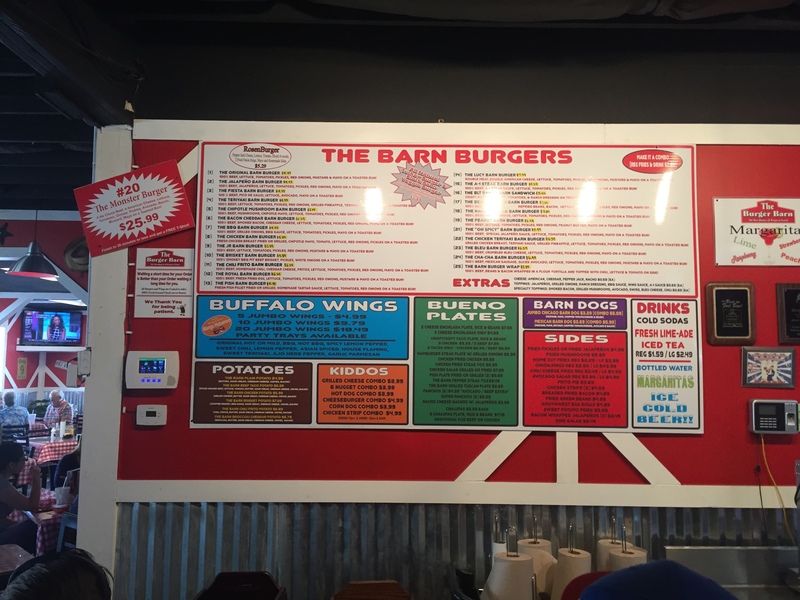 The Burger Barn definitely delivered on its promise of more. These burgers were a handful. 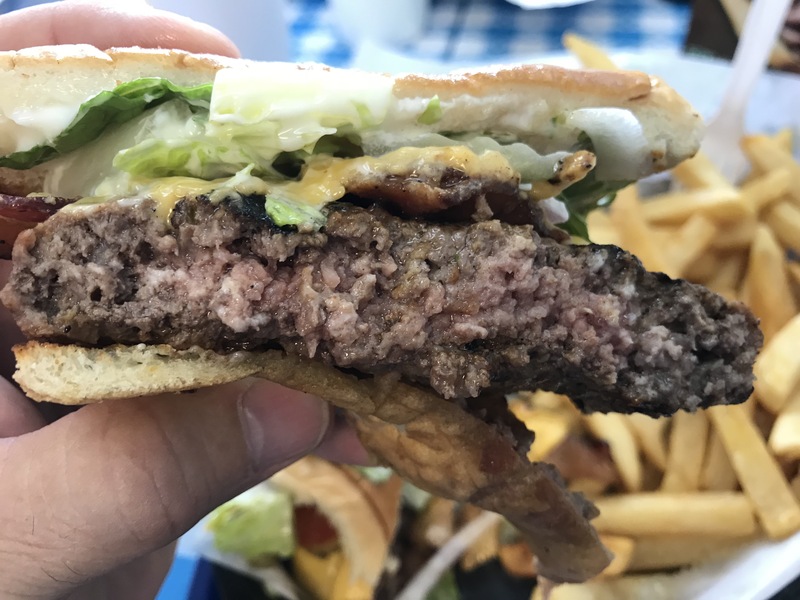 The first bite was all it took to convince me that The Burger Barn also delivered on its promise of more taste and fresh ingredients. The bacon, by the way, was really good. Everything about this burger worked perfectly to deliver more taste. And the onion rings were mighty delicious, too. No regrets about making the drive to Rosenberg. As for Brad and his boys, they each gave a thumbs up to the whole experience. Whether you are on road trip or just looking for a place near you to eat a good burger, be adventurous and be intentional. Don’t be afraid to break away from the fast food chains to try something different. 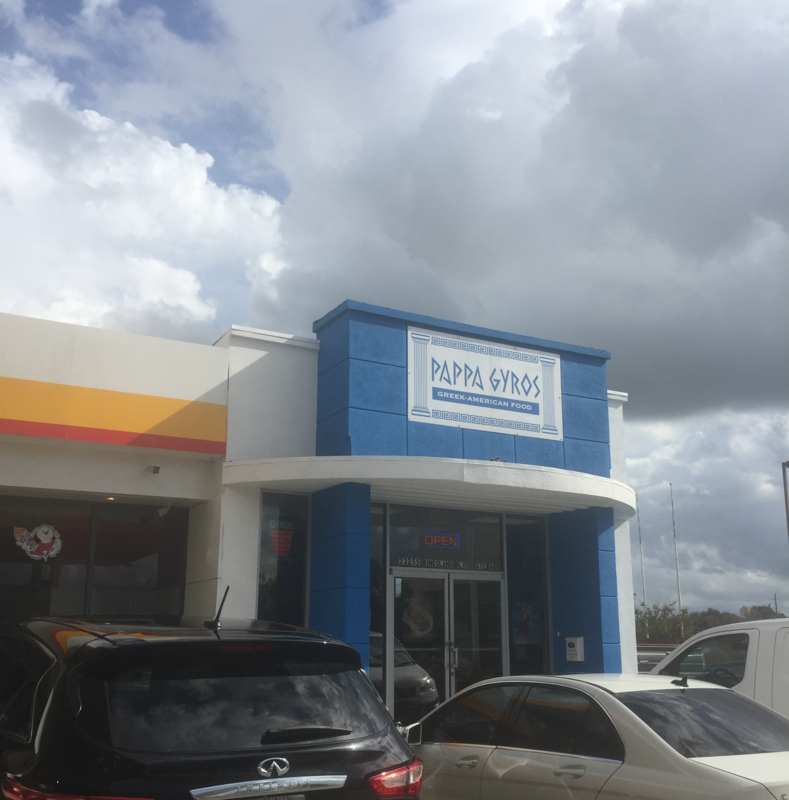 Pull over and check out those burger joints with interesting names. If you do so, you will make some delicious discoveries. There is no question in my mind that the best burgers on the planet are right here in the Lone Star State. 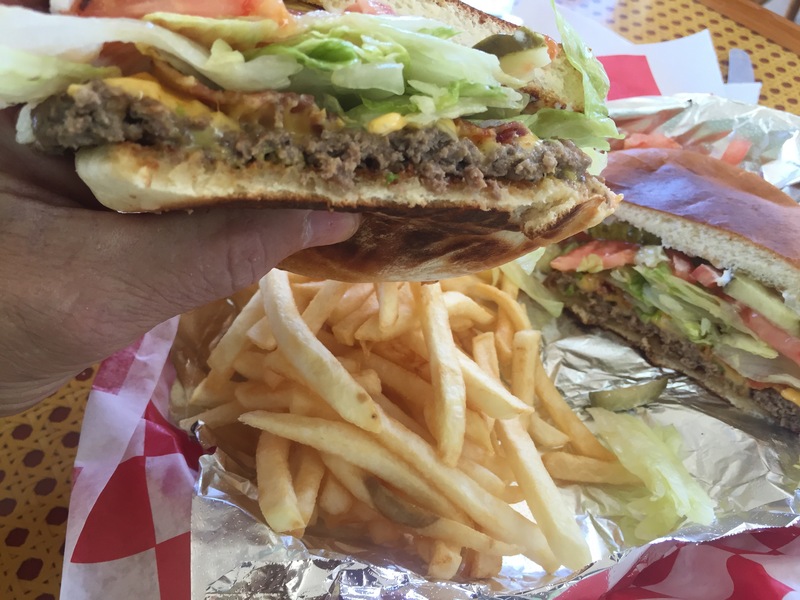 One of the best things about wandering down Texas backroads is discovering new places to eat a burger. On a recent day trip to take photos of windmills and railroad tracks, my friend Doyle and I found ourselves in Eagle Lake at high noon. And we were mighty hungry when we drove into this small community whose presence on Texas maps dates back as far as 1821. Eagle Lake is located on Highway 90A east of the Colorado River and fifty miles southwest of Houston in southeast Colorado County. Folks believe the town was named by two of Stephen F. Austin’s scouts. When one of them killed an eagle on the lake, he called the water Laguna del Águila, which is translated Eagle Lake. When we drove into town I asked Siri, my faithful smart phone concierge, to retrieve a list of burger joints in town. Peppers Burgers and Fries seemed the most interesting so that is where we headed. On our first pass we missed the restaurant entirely. So, we turned around and drove a bit slower and almost missed it a second time. Peppers is housed in a modest little building on Main Street. The only sign is out in front of the building. The young lady at the counter told us that they’ve only been around for about a year. We ordered our meal at the counter and then sat and sipped cold iced tea while we waited for our food in the small but very clean dining area. I ordered the Bacon Cheeseburger Combo and opted for fries rather than the side of okra offered with the meal. The service was reasonably fast. My burger arrived complete with a generous portion of slender fries. All of the ingredients were crispy fresh and held in place by a hot butter grilled bun. As for my first bite — it was good. What I held in my hands was not some fancy gourmet inspired city burger. This was just an honest small town burger. No pretense. Just the basic burger ingredients that worked together well to make a good homestyle burger. I was not disappointed. I enjoyed my burger and certainly felt that I got my money’s worth. 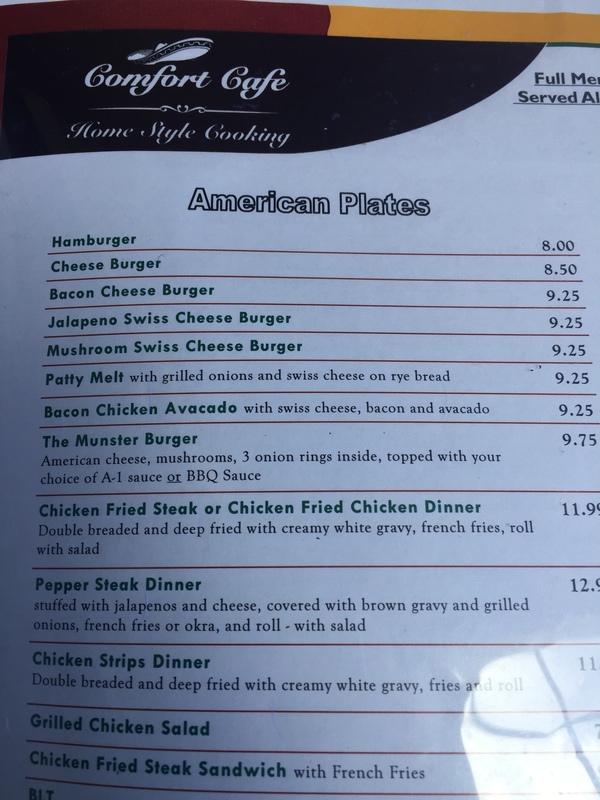 There are not a lot of burger options in Eagle Lake. If I lived in town I would make it a point to eat at Peppers on a regular basis. And, as their sign says, they offer burgers — and more. If my travels take me through Eagle Lake again in the future, I will be sure to stop and sample some of the other things on the menu. 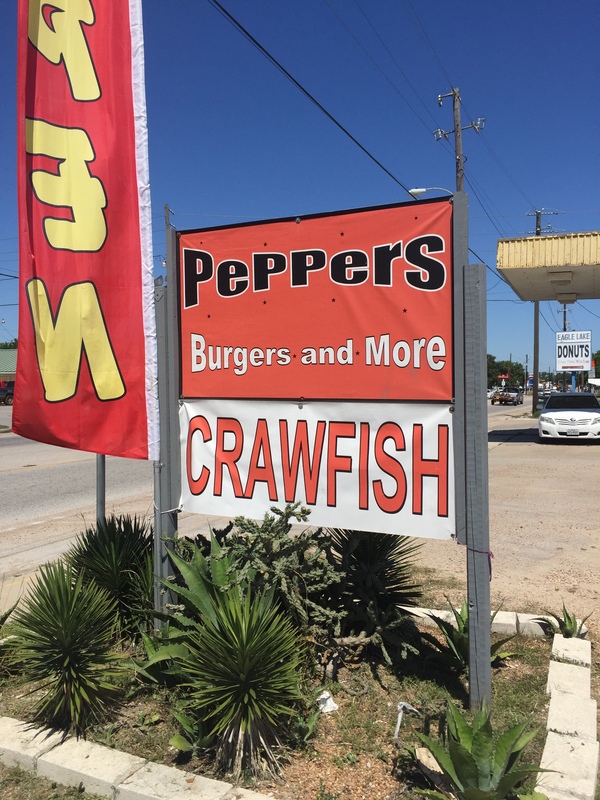 And, if you ever find yourself in their neighborhood, stop by Peppers and give them a try. I think you’ll be glad you did. 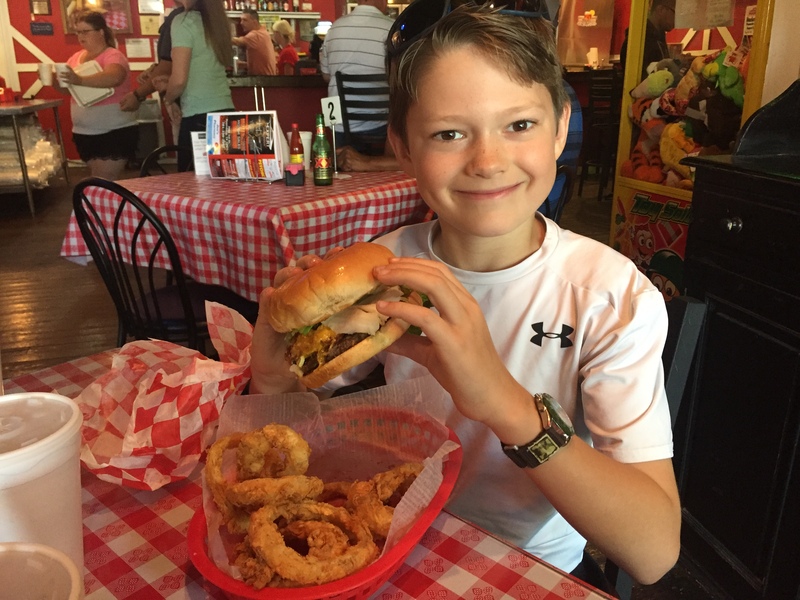 Searching for the best burgers in Texas is an enjoyable part of my adventuring in the Lone Star State. I have discovered that there are no shortages of places to find delicious burgers. I have visited some burger joints at the recommendation of friends, others because I read about them in some publication, and occasionally I just ask Siri to find me burger joints close to me as I wander down highways and byways. While recently traveling from Katy to Big Bend Ranch State Park, I asked Siri to find me burger joints near San Antonio. Siri produced her usual list of fast food burger places as well as other options. That’s how I learned about the Dog and Pony Grill in Boerne. To be honest, my buddy and I decided to try this place just because we found the name so interesting. Google maps did the rest of the work and guided us to the parking lot. We arrived a bit early for lunch but with enough of an appetite to eat a healthy-sized burger. 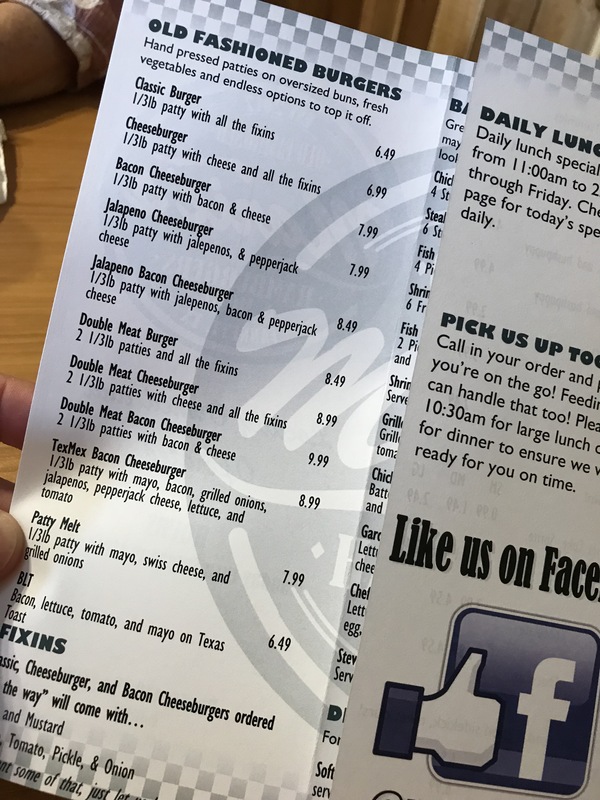 At the recommendation of the young lady at the counter, I ordered the Bodacious Boerne Cheddar Burger, listed as “Our Favorite Burger” on the menu. This burger comes with a healthy one-third pound of pure beef and is topped with lettuce, tomato, pickles, onions, mustard and mayo. A side order of onion rings and a cold cup of sweet tea completed my order. 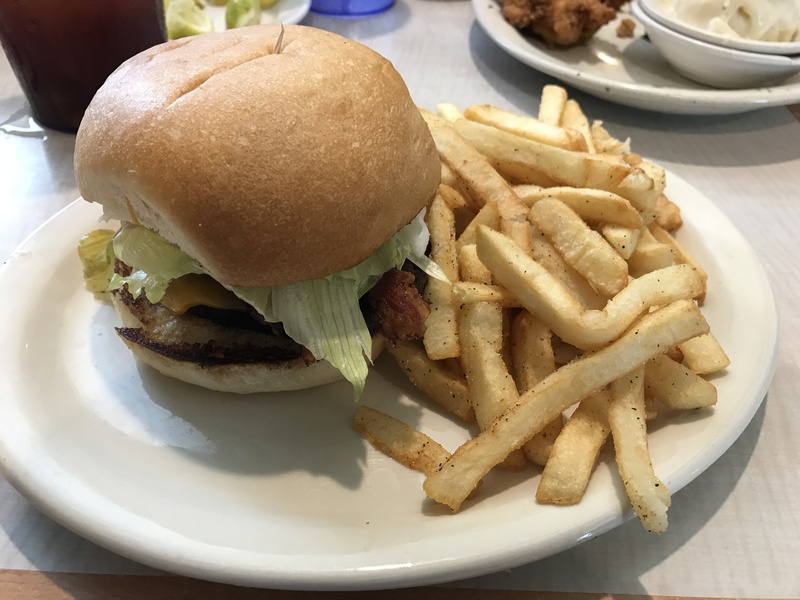 When I started writing about burgers on my blog I decided that if I did not have anything good to say about a burger I just would not write about it. 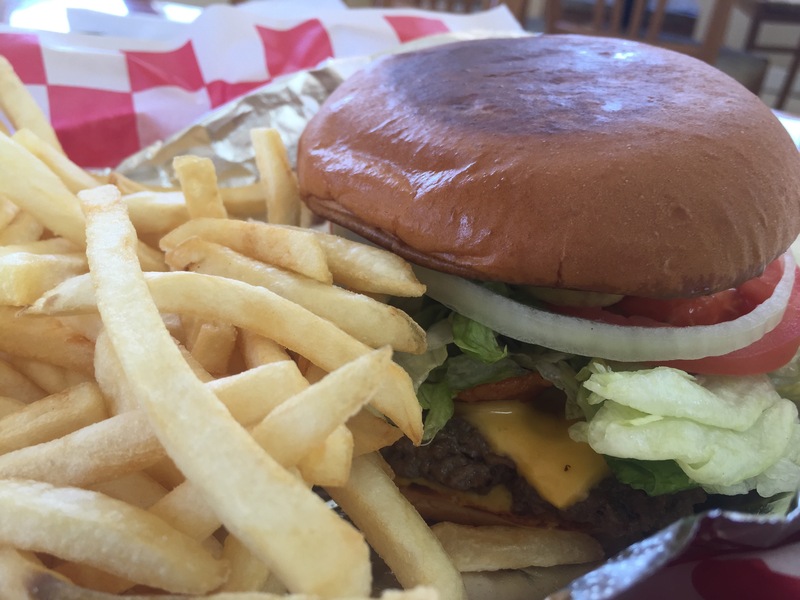 So, I am writing about the Bodacious Boerne Cheddar Burger because it definitely outclassed a lot of burgers I have eaten and because it was pretty doggone tasty. Wow! I mean it was a really good burger. Everything about his burger worked well, from the amazing bun to the delicious cooked-to-perfection patty. And the onion rings were pretty good, too. After taking my last bite, I took a deep satisfying breath and determined that this is a place I want to visit again. And it’s a place I highly recommend to anyone passing through the area. 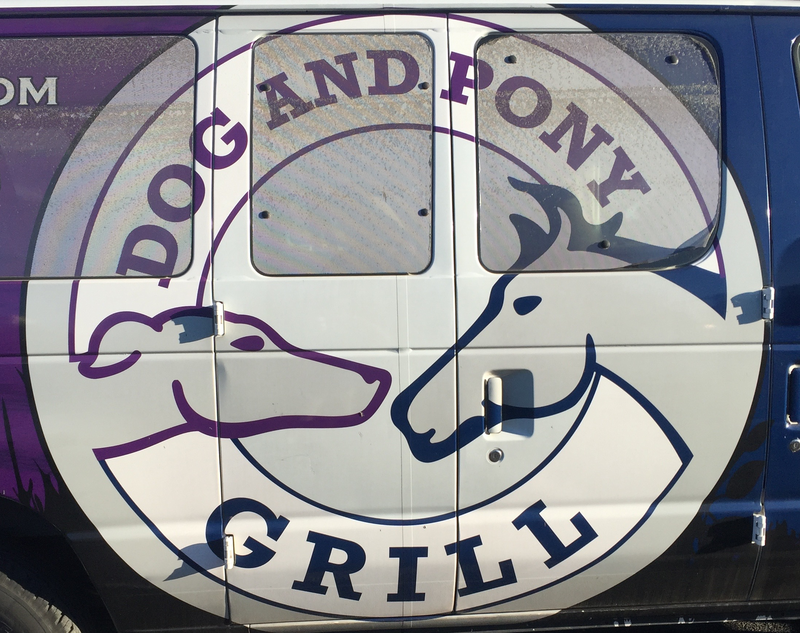 In fact, it’s worth taking a detour to go to the Dog and Pony Grill if you are anywhere near this part of the state. 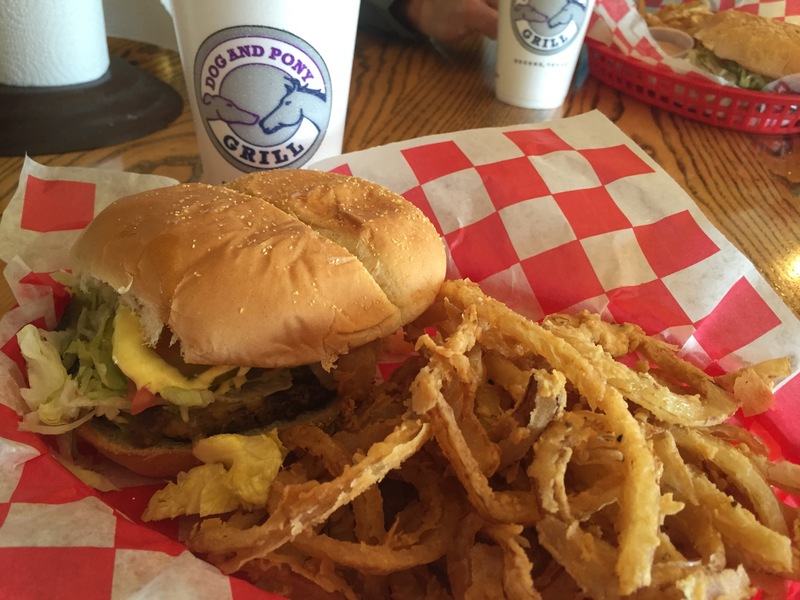 The Dog and Pony Grill offers a lot more than their tasty burgers on their menu. The joint has a cool and comfortable vibe — the kind of place where you can have a good time with family and friends. 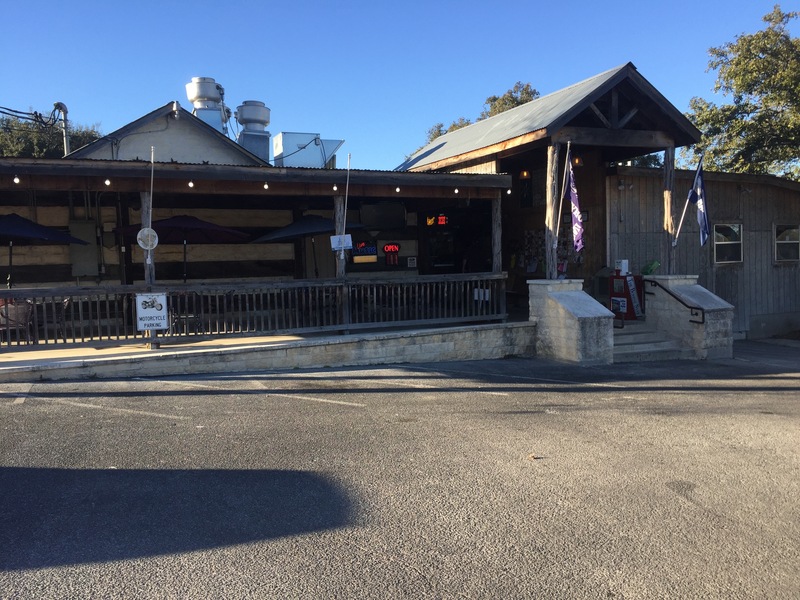 The next time you find yourself near Boerne, set your map app to get you to the Dog and Pony in time for lunch. You won’t be disappointed!